TME’s offer has been enriched by Optidrive E2 inverters. The flagship model of the series is the inverter designed for single phase motors with built-in capacitor and for shared-pole single phase motors. Single phase Optidrive E2 inverter uses a revolutionary motor control technology, similar to the one used with three phase motors (modulated frequency and amplitude of the output sine wave). Single phase Optidrive E2 inverter has only 14 standard parameters to set up in its basic form. This fact, along with the intuitive menu, ensures quick and easy commissioning of any drive. For more advanced users, the extended parameter set gives access to numerous additional functionalities. 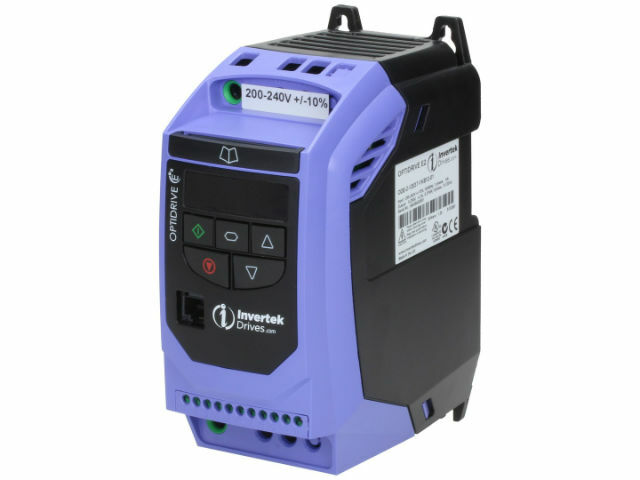 Single phase Optidrive E2 inverter can be used to provide efficient power control and accurate speed control of single phase motors in a variety of applications, especially in fans and pumps which usually do not require high starting torque. The control method used provides significant energy savings compared to alternative methods, and the revolutionary single phase motor control method ensures reliability at start-up. Symbol Supply Voltage Output voltage Rated current Max. motor power Output freq.